In response to the massacre in Charleston, an Interfaith Vigil for Peace and Racial Justice will be held Wednesday, June 24. Sponsored by the Princeton Clergy Association and Mt. Pisgah AME Church and the Coalition for Peace Action, it begins with a march at 7 p.m. at Mt. Pisgah AME Church, ending at Tiger Park at 7:30 p.m. in Palmer Square. As darkness falls, at 8:45 p.m. there will be a candlelight vigil. 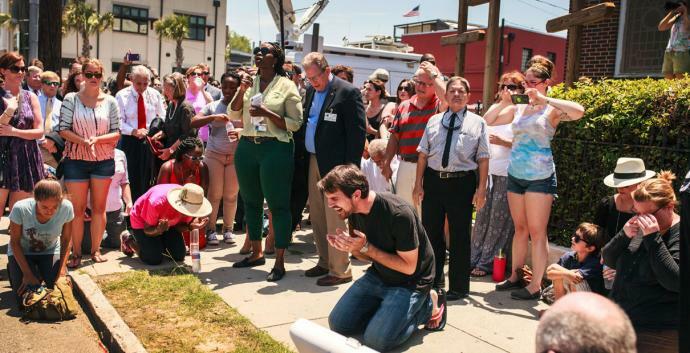 And here is a post from the United Methodist Church national communications, about a vigil in Charleston, pictured above. This entry was posted in Community, Ministries, Missions, Worship and tagged AME Church, Bishop John Schol, Charleston, Coalition for Peace Action. Bookmark the permalink.